Based on a written test that will be objective & syllabus is Science & Maths of Class IX & X Board. Class X appeared / passed. Minimum percentage required to appear in our entrance test is 70% (Science + Maths) of Class IX / X Board exam. This two-year course helps students to develop a solid foundation for competitive examinations like JEE, SAT, BITSAT, VITEEE etc. 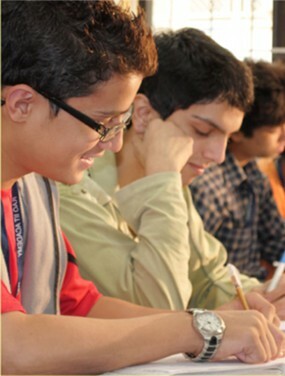 The academically stimulating environment, small batches and one to one interaction with the teacher ensure that even smallest of doubts is cleared. More importantly, we train you to think analytically, we give you a systematic approach to problem solving, a must for JEE. This course doesn't clash with their preparation for the 12th Board exams rather it compliments it and that is the reason why most of our students do well both in JEE and in their 12th Board exams. This course also gives an edge at National Olympiads in Physics, Chemistry and Mathematics and to come out with flying colors.